We’d love your help. Let us know what’s wrong with this preview of Wardens of Issalia Boxed Set by Jeffrey L. Kohanek. An enemy nation rises, fueled by subterfuge, assassinations, and fire-powered weapons. A team of young agents must infiltrate and eliminate this threat before all is lost. 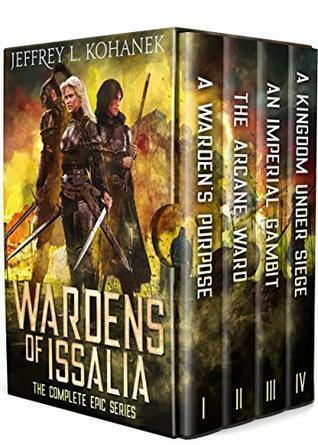 Includes the COMPLETE Wardens of Issalia series -- novels that combine for over 75 5-star Amazon reviews and 150 Goodreads 5-star ratings. Quinn is Everson's overprotective sister. Although average in every way, Quinn's fiery spirit and relentless determination fuel her desire to protect those who cannot protect themselves. Trained as an espion, she finds herself alone and in the heart of an enemy stronghold. Cassie is Brandt's twin sister and his coconspirator until things go too far. She joins the wardens and discovers magic abilities unlike anyone has ever seen. To ask other readers questions about Wardens of Issalia Boxed Set, please sign up. Adventurey feeling fun, with some mildly dangerous situations that Everson and Quinn get themselves out of through their own devices. The sibling’s have a great relationship with each other and there was a nice collection of friends and other activities to round things out at the school, and some life messages about bullying, and acceptance. It’s a fun start to the series. Exciting and fast paced. New faces join the story and Quinn and Everson are settling in as the story starts getting a bit more grown up with Everson building interesting things incorporating the Runes magic into tech stuff, and neat little gadgets to help his sister and fellow teammates out while they’re doing field work and Quinn is sent on her first mission alone. The Tantari kingdom in a precarious position, with the Empire starting to gain more of a foothold in the country-endangering our friends at Icon and all Chaos-based magic users. This was my favorite of the series because we get to see a little of Iko’s side of the story and the focus in this book has narrowed down to the important players. There is lots of tension and the stakes are getting higher. This series has grown from school recruitment to in-field missions and threats of war over the last four books and it all comes together in this book. We jump right back into the midst of things for an exciting and action filled conclusion, where unfortunately, not everyone will make it. A great series and a huge amount of fun! A Warden's Purpose - Two different school and two siblings, each will take a different path. Everson is heading to focus on magic and science while his sister Quinn will be focused on military excellence. There is a lot going on and it play out rather well. I was more drawn into Quinn's story than Everson's just because she was more like me. Both sides were interesting to watch play out. I was wrong about a couple of characters. I really enjoyed this book and look forward to reading more about Qu A Warden's Purpose - Two different school and two siblings, each will take a different path. Everson is heading to focus on magic and science while his sister Quinn will be focused on military excellence. There is a lot going on and it play out rather well. I was more drawn into Quinn's story than Everson's just because she was more like me. Both sides were interesting to watch play out. I was wrong about a couple of characters. I really enjoyed this book and look forward to reading more about Quinn, Everson and their friends. The Arcane Ward - The next part in Everson and Quinn's journey. I am still loving these two, but the new additions are great as well. This time around the story starts out with other characters, then you get to see Everson and Quinn interacting with them. The twins, Brandt and Cassie, are mischief makers sent to train as wardens. I can't wait to see where this all leads in the next book. I am sure I won't be able to put that one down either. An Imperial Gambit - So much packed into this book. I love this series, and Quinn is still my favorite. Cassie is another favorite of mine. I can't wait to see what happens next. A Kingdom Under Siege - will update, when I finish this one. I love this series. It's fast paced, inventive, and incredibly well written. Kohanek created on of the most unique and memorable worlds within these books and probably some of my favorite characters ever. Quinn is the young woman every girl should look up to! She's probably one of my favorite characters of all times. She's loyal, strong, brilliant, self assured, and kind. I want her to be my friend! And the young men in this book are the kind of men that every boy should look up to. Not only do I love this series. It's fast paced, inventive, and incredibly well written. Kohanek created on of the most unique and memorable worlds within these books and probably some of my favorite characters ever. Quinn is the young woman every girl should look up to! She's probably one of my favorite characters of all times. She's loyal, strong, brilliant, self assured, and kind. I want her to be my friend! And the young men in this book are the kind of men that every boy should look up to. Not only do they have many of the same qualities as Quinn but they bring some of their own important qualities too. Everson found a way to better his life, despite the disabilitt he has to struggle with. Brandt doesn't let his royal upbringing to turn him into a pampered prince, instead he choices to fight for his kingdom even at the risk of his own life. And none of these young men fret when the women outshine them, but continue their praise and support. A fantastic magical adventure series following a group of young people, all very talented in their individual ways. They are young, but well trained and it rests on their shoulders to save their world from destruction. Recommend it to anyone, young or old, looking for a great fantasy read. It is a wonderful series from the first to the last book. This is a great series! Jeffrey is a very talented author, who has created a wonderful world in these books! Great writing, dialog, action, and storyline! I highly recommend checking this series out! This book is something special i don't hardly ever write reviews but because this book was very captivating from the start I just had to do it this time.The pace is just right ,the author did a wonderful job of building a world so the story line flows and doesn't stay stagnate .I just bought a new book for about 15. $$ and didn't get half way through but it had a beautiful cover that's about it .This book was 1$$ and it has more sustains in the the first chapter then a lot o Beautifully written !